A few days ago, I arrived home after 11 days in the Allagash Wilderness. I had the distinct opportunity to canoe the acclaimed Allagash River. This waterway has a historic value in both it's phenomenal brook trout fishing and notoriety in it's place literature - via Thoreau. 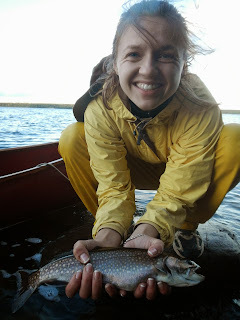 My girlfriend, Katherine, and I set out to pursue both the hunter, Musky, and the hunted, brook trout. I grew up fishing the St. John River, which was once know as a productive and fabled brook trout fishing river. Long story short, muskellunge "musky" were inadvertently introduced to the watershed and the trout vanished like a freshman waking up next to the "musk" of old man Wilkie. I am not sure that this is the root of their name, but it certainly could be. Musky have since taken a strong hold over the St. John and Mainers near and far are rightfully concerned that these fish are going to get into the Allagash and it's headwaters. Luckily, there is a 40 ft waterfall keeping them at bay. A healthy Chamberlain brook trout. Get ready for the "big dance". Eagle Lake provides the brookie of the trip. Katherine holds up the beast - her first Musky. Near 20 brook trout came to net over the first 10 days and 3 Musky over the final 1. Back to civilization. righteous! a fine adventure indeed! well done sir! how much longer are you around? Clark, not sure how I didn't post a comment on this since I've read it probably 3 or 4 times. I remember your report prior to your post and I must admit you greatly downplayed those Brookies....some handsome fish there. That big Musky is a web gem as well. Awesome trip, well done my friend!